At Davis Bros. Furniture, being a family run business, we know the importance of family and being able to sit together for a family meal. We offer a variety of dining room sets to fit any type of dining or eating area in your home. We have many rustic sets with tree trunk legs and log chairs, the perfect dining choice for adding warmth and coziness to any meal. Our dining room showroom boats tables of all sizes including your traditional rectangle, square farm tables, round, oval, and some with extensions. 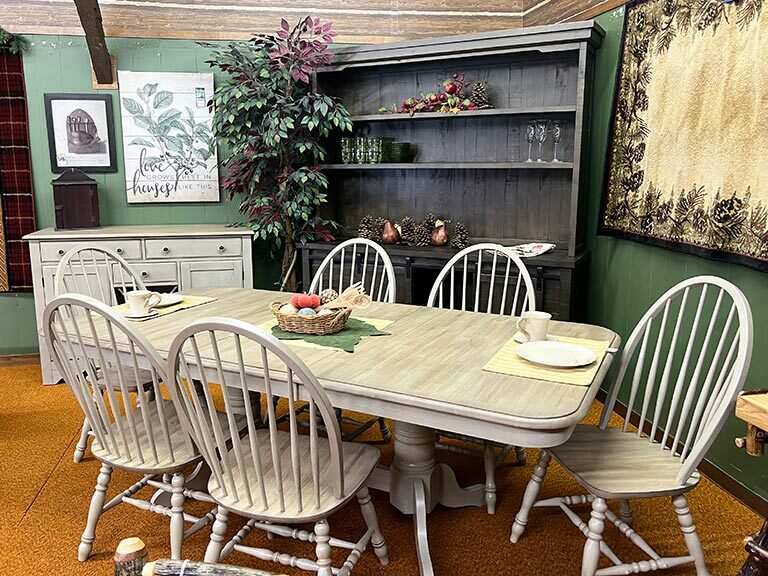 You will also find a rustic selection of Amish dining furniture; beautiful, solid wood, heirloom-quality construction that will serve your family for generations. Not only will you find tables and chairs but we also carry a selection of curio and china cabinets, bar stools, wall décor, area rugs, and even antler chandeliers to match your dining room set. Stop in today and let us help bring your family together during the meals.